“The creative organization of information creates new information,” wrote architect Richard Saul Wurman. This axiom is at the core of our work. When we organize information—that is, when we structure it, order it, display it, label it, connect it—we alter it. We change how information will be perceived, for better or for worse. That’s a lot of power—power that we don’t always recognize is ours. And when we don’t recognize it, we can’t be careful about its impact. We risk building sites that aren’t clear, usable, or inclusive. We risk alienating, even harming, users. And users have enough cards stacked against them already. Information literacy is low, stress is high, distractions are abundant, and capitalism is a grind. Everyone—users and web workers alike—is trying to navigate an internet that is both mandatory and hostile, that craves our data but cares little for how it makes us feel. As builders of the web, we have a responsibility to change that. And we can—by being more communicative, more ethical, and more empowering in our organizational choices. The goal of this book is to help you do just that. You may not consider yourself an information architect, but maybe you’ve been tasked with assessing and categorizing your site’s content. Or you’ve just jumped in on an unfamiliar sitemap project. Or you’ve never built a taxonomy before. Wherever you’re coming from, the principles and practices of information architecture can help you craft more thoughtful information spaces. Our journey won’t be exhaustive when it comes to information architecture, but we will look at the everyday work of the web through a structural lens. In Chapter 1, we’ll discuss the importance of organizational frameworks. In Chapter 2, we’ll learn how content can inform strategy and scope. Chapter 3 examines the building blocks of sitemaps, while Chapter 4 shows us how to put them together. In Chapter 5, we’ll ensure that users can find their way, while Chapter 6 explores the applications (and implications) of taxonomies. All the while, we’ll be thinking about why we’re doing this at all: to help people find, understand, and use information—information that can make a difference in their lives. Because if we aren’t going to use our power for good, who will? If you want to make your website more usable and your content easier to find, then this book is for you. 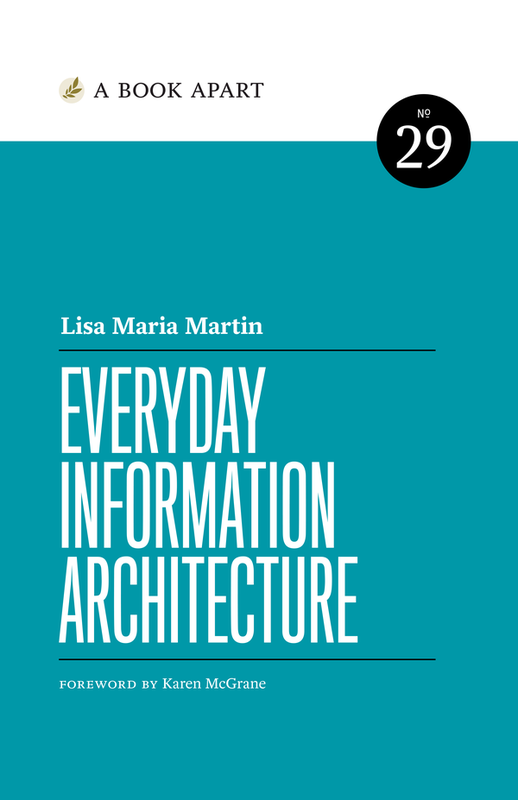 Lisa Maria Martin shows you how to structure and organize information with simplicity, clarity, and warmth—so you’ll feel prepared, not perplexed. Loaded with helpful frameworks, practical tips, and plenty of humor, this is a book you’ll reach for again and again. Lisa Maria Martin is an independent consultant based in Boston. She practices content-driven information architecture, helping organizations to understand, organize, and structure their web content for empowering user experiences. She is the managing editor of A Book Apart, as well as a writer, speaker, workshop facilitator, and poet.